Stunning corner 1 bedroom 1.5 bathroom residence at the sensational 45 Park Avenue! Enjoy high ceilings, rich hardwood floors, and beautiful floor to ceiling windows. rising above the neighboring buildings, enjoy skyline views to the North and East, with a beautiful view of the Chrysler Building. The home has a professional grade granite Viking kitchen with abundant counters, and cabinetry. The king sized master suite has a palatial en-suite bath with soaking tub and shower. The apartment has a vented washer/Dryer and comes with a coveted deeded storage unit included in the price. 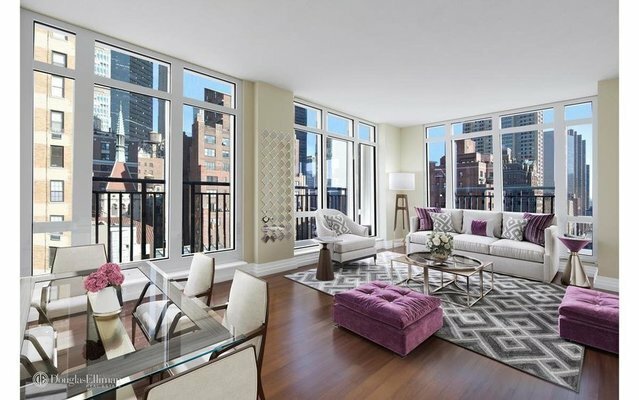 45 Park Avenue is an award winning full service luxury condominium. Located along the on the picturesque corridor of the Park Avenue Malls with their seasonal plantings and in the exclusive "Embassy Row" section of Park Avenue. Amenities include 24 hour Doorman/Concierge, a state of the art 2nd floor gym, elegantly appointed lobby, chic resident lounge, landscaped & furnished roof deck, cold storage, garage, and bicycle storage. Conveniently located nearby the trendy Nomad District, Bryant Park, Madison Square Park, with many world class dining, shopping and transportation options.